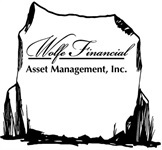 Home | Wolfe Financial Asset Management, Inc.
At Wolfe Financial Asset Management, Inc., we're here to help you pursue your overall financial goals and guide you through the complexities of planning for your retirement. Using our client-centered approach, we seek to help you design a framework that allows you to pursue financial confidence during the next phase of your financial life. Let us help guide you toward a more worry and stress-free retirement. To view your accounts online please click here. If you do not have access and would like online viewing capability, please contact our office. Your form 1099 will be delivered as early as possible, beginning January 31, 2018. By February 15, you will be mailed either your 1099 form or a special Pending 1099 Notice. The Pending 1099 Notice will be sent if issuers of securities you hold have not yet provided their final tax information. It will inform you of the securities that are pending final reporting, and will provide the anticipated mail date of your 1099 form. Your 1099 will be mailed no later than March 15, 2018. Clients have the ability to easily download tax forms directly into Turbo Tax software. Clients need to have access to their Pershing accounts online via NetXInvestor®. To access account information with Turbo Tax, select NetXInvestor (Pershing) as the brokerage institution.To download tax forms, simply use the NetXInvestor user ID and password, along with the financial institution number (3KZ).